Anelise Chen is the Daily’s newest correspondent. Her column will explore the scientific phylum Mollusca. This week, a clam has an identity crisis. 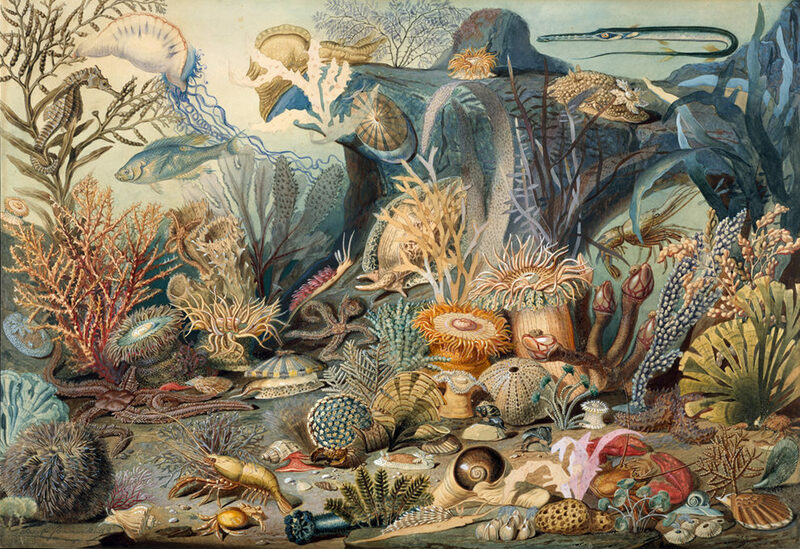 James M. Sommerville, Ocean Life. She hadn’t meant to become a bivalve mollusk, but it happened. Last fall, after a rib-bruising bike crash caused by momentary inattentiveness and conditions of reduced visibility (sobbing while cycling) the mollusk had briefly succumbed to an episode of hysteria, during which her mother kept texting her to “clam down.” Clam down, she demanded in that sober, no-nonsense way. At first, the clam looked all around her, like, Who, me? Until she realized that her mother was addressing her. It made sense. 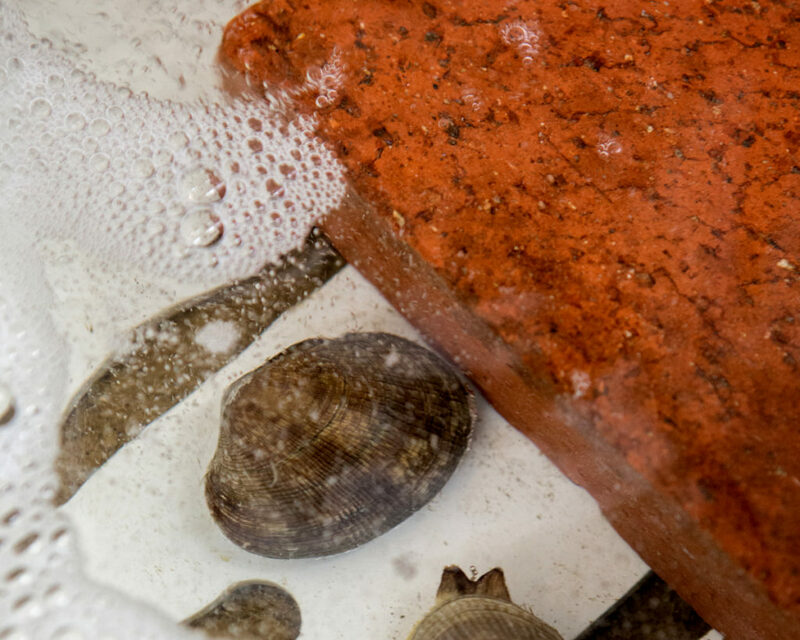 Since the clam’s separation from her partner, she had been consuming a lot of calcium carbonate. This is what clams and other shell-building animals use to make their shells. She kept rolls of them in her bag, and they got whittled down throughout the day with alarming speed. On her desk, beside her usual writing implements—pen, notepad—was a flip-top container that was more fun to feed off of; it rattled percussively when she shook the tabs out into her palm. These tabs were tropically flavored, in delicate pastel colors. Humans were not supposed to ingest more than ten per day, but clams could eat them as needed. Both species possessed a stomach, and hers hurt most of the time. Now the clam lived in New Mexico, a landlocked state far from the sea. Upon waking, she would stare at the mute, beige ceiling of her adobe casita until the first words occurred to her, usually something like, How did I end up here? It was like a bird plucked her from the shore, dashed her upon some rocks, then forgot to eat her. She thought it was a fair question, though a friend once chastised her for expressing it. Why not adopt the perspective of a bodysurfer? he suggested. We fall under the fallacy of control when we refuse to be carried along by a certain momentum. She wondered about mollusks that bodysurfed—usually, when the waves came, they clamped down hard, waiting for the nightmare to be over. The clam suspected that phrases like “How did I end up here?” and her other reliable favorite, “I am a bad person,” were the protein matrix upon which she constructed her shell. Her shell was her story; it held her together. But because this shell was her own shell—she lived inside it, it contained her—she couldn’t see beyond it. Contents can’t see outside the parameters of their own packaging; it would be like questioning your mind with your own mind. All she could do was add to her shell, one line at a time, in layers, like writing. If only she could look into a mirror, she thought, to see what she was. All photos by Angela Chen. 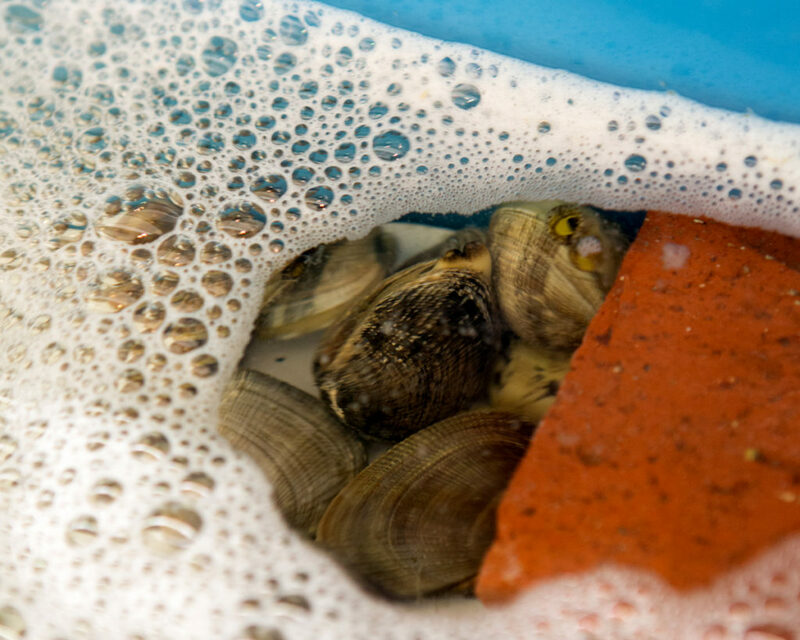 Despite being helpless and delicious, clams have nevertheless managed to persist through time, thanks to their simple, ingenious technology. What clams lack in intelligence they make up for in endurance. Clams are “particularly hardy” creatures, appearing in the fossil records as early as the Cambrian Period some 510 million years ago. Which means that clams had survived through mass extinctions that devastated other, superior creatures, such as dinosaurs and mastodons. Some clams are so tough they manage to dwell 17,400 feet down on the dark sea floor, enduring hydrostatic pressure of almost four tons to the square inch. And down there, they live on and on. The oldest living animal ever discovered was a deep-sea quahog named Ming the Mollusk who was 507 years old when he was dredged up from the ocean floor. As she read, the clam began to feel warm, validated. Perhaps it was the coffee, or the desert sun slanting through the dusty windows. These facts were doing a lot to legitimize her methods. By clamming down, her species had actually done quite well for itself. Hadn’t this clamming down method worked well in her marriage? It was only after she decided to open her big mouth that things got bad. Before, instead of opening her mouth to spew seawater and sand, she kept whatever was bothering her inside, even if it was only a small grain. Over time, the objection became nice and round and pink. Left alone, she would take the object out from under her tongue, evidence of a job well done. Look what I’ve made! Look what I’m capable of! Unsaid feelings could coat the small agitation until it was nothing. Because she was an artist and this was how she felt strong. Consider the example of her mother, the clam from which she descended. Some years ago, the clam’s sister discovered a document in a shared Google drive that turned out to be their mother’s journal. This journal read more like a captain’s log than a confessional text, as it betrayed nothing about how she felt. Which was uncanny because this was a journal she kept during some of the family’s most tumultuous years. In lieu of emotion, the journal was full of exhortatory language, with which she compelled herself to think positive, lose weight, and stay claaaaaaaaaaaaaaaaaaaaaaaaaaaaaaaaaaaaaaaaaaaaaaammmmmmmm. Either their mother had fallen asleep while typing that sentence, or it was meant as a stage direction: READ WHILE SCREAMING. Oh, her mother’s clam smile. That tight, insistent grimace that stretched from jowl to jowl. With it, she could smile her way out of anything. A few days ago, when the clam called to express her condolences after learning their grandmother had passed away, the clam’s mother came on the phone to say: “Hi! I am okay!” That was all she had to say on the matter. Just then, the clam was interrupted from her reading. The man sitting across from her, previously obscured behind a stack of law books, suddenly wanted to know why she was reading that science book. The clam stammered something—“I am a mollusk”—then pushed the book forward, as though to prove she wasn’t doing anything illegal. He had the air of a suspicious man, and he was reading law books, after all. She pointed in the book to a wavy scallop, to a sea hare shooting ink, to a ribbon of eggs that looked like a badly executed crochet project. “Did you know you can give clams Prozac to make them spawn at the same time?” she said in a strangely solicitous way. It was something she tended to do around men. “Apparently love is scalable.” The man tilted his head in that characteristic way of perplexed dogs. Then he passed her a piece of paper with his name and phone number on it. Later, the clam would wish that she could have said something different. After he texted “It was nice to meet you!” and she texted back “Nice to meet you too!” and he texted “I think I’m in love!” and she texted back “Ha” and he texted more and more things to which it became increasingly difficult to respond, she would retreat into her old trick, into silence. Finally, when he texted to ask for more things that were impossible to provide, she would block him without explaining why. If one were to read the conversation, it would not have been obvious that anything wrong had happened. She was cheerful and pliant—then suddenly she disappeared. She imagined his electric pings now deflected by a protective dome, like a bomb shield. But no one could say that she had made herself known, because she had said nothing. Why was she always adopting the defensive posture of prey, she thought angrily afterward. Why couldn’t she open her mouth to say, Please stop. You are making me uncomfortable. It was easier for the clam to clam down. Did this make the clam feel calm? There was so much the clam didn’t know, and now it was too late. Her early exposure to sea life had been restricted to the seafood section at 99 Ranch Market, a kind of poor kid’s aquarium. Upon being released from the car, she and her sister would rush over to gently torment the sea creatures. 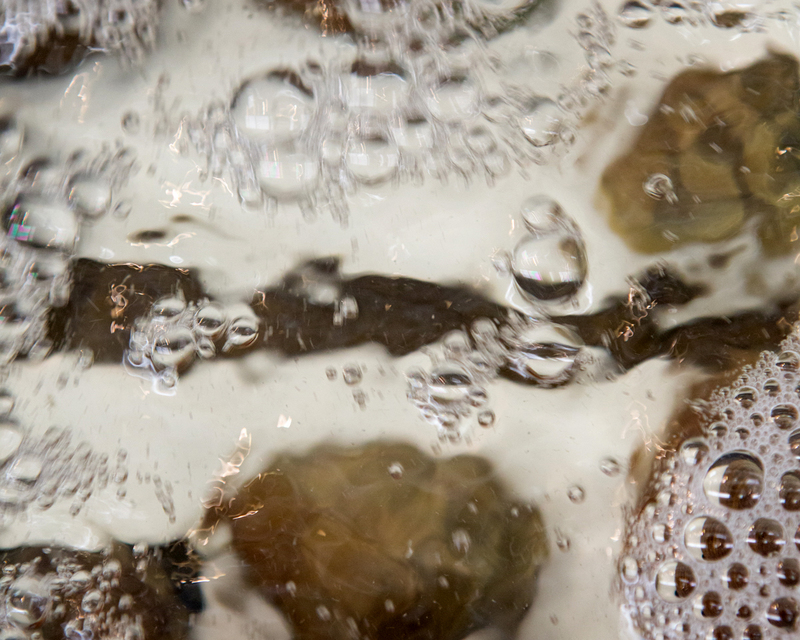 They tapped on their shells with metal utensils and splashed one another with murky brine. Peering over those heaped bins, she had felt a strange sense of calm. It was a moral education; something you could call on to get you through the bad times at home. 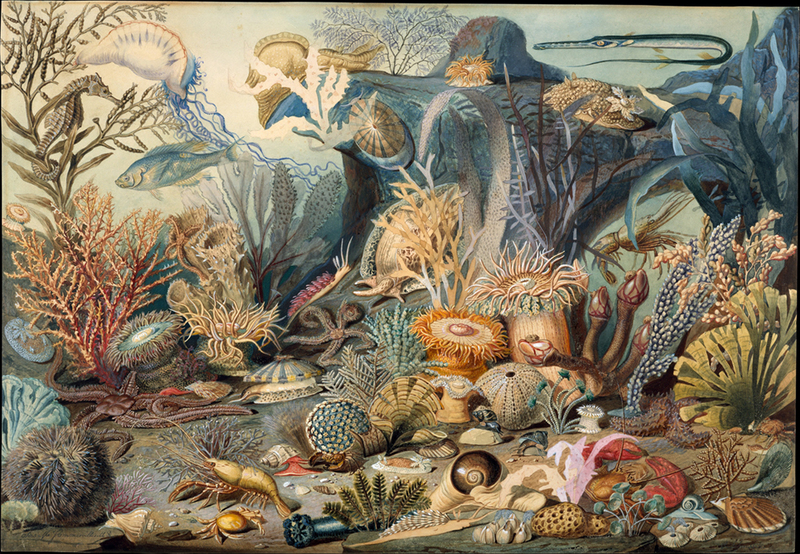 Whether condemned to the seafloor or condemned as food items to be poked and prodded by children—these creatures still had recourse against pain. If you shut yourself tight enough, nothing would happen to you. But it was too late to disabuse one’s former self of misguided notions. As a child, she believed that the clams that stayed shut even after their counterparts had been steamed to death were the ones worthy of emulation. When in fact those were the dead ones, the ones you were supposed to throw away. She did not even know that clams spend much of their lives with their mouths slightly ajar, like undersea mouth breathers. Their gills are located in the mantle cavity, through which oxygenated water can flow. Ignorance of this fact is why amateur cooks often suffocate their clams by placing them in cold bowls of water before cooking. Don’t they like being in water? You can’t mitigate your shellfish’s suffering by providing a cheap facsimile of their projected wants. Clams, like humans, need to open their mouths to live. The clam finally turned down her computer, rubbing her eyes. It was dark outside, beyond her yard, a dark so potent the rods in her eyes definitely got the message. Time to sleep! Time to become oblivious! The clam turned out the lights and prepared for bed, thinking about how, over the course of several days, she had changed the subject of her essay from “I” to “she” to “the mollusk.” And from present tense to imperfect to the simple past, the verb tense of children’s tales. Was this yet another manifestation of her clam-like nature? She was trying to grow the distance between herself, saying without saying. Burrowing into these silted layers of grammar. Maybe tomorrow everything would make more sense. She would undo all of this distance and change all the tenses. She would evolve into a different species. Before sleeping, the clam opened up Kafka’s Metamorphosis, a story about another young human who woke to find himself morphed into an invertebrate. She once loved this story—it had seemed a fitting analogue for puberty—but now, reading it again, she felt unsettled. How had she not understood the true meaning behind this story? She recalled that Samsa had been horrified by his transformation, but reading again, it was clear he was actually quite indifferent about it, since turning into a bug was not his real nightmare. Rather, the real nightmare for Samsa was that he was not needed by his family. That the family he thought he was supporting, the family that provided such a convenient excuse for him to suffer another day at a job he despised, was in fact perfectly capable of getting along without him. The debts would somehow get paid; his adoring sister would get married. If this were true, the story seemed to say, that the family didn’t need Samsa (as a bug or otherwise) then what was preventing Samsa—or if one were inclined to read Samsa as a proxy for Kakfa, what was preventing Kafka—from declaring himself to his overbearing, industrialist father? I want to be a writer. I won’t trouble myself with your expectations any longer. You’ll survive without me, even if I do turn into a bug in your eyes. A person incapable of doing this could only be a creature without a backbone—no better than a bug. The clam closed the book and lay there in the dark. It was late; tomorrow she would wake up groggy for morning practice. She recently joined a swim team, so she spent the first two hours of each weekday submerged in water, moving her limbs in concert with others. It made her happy in a basic, elemental way, boring and not worth commenting on. Only she did have a problem with her breathing pattern, namely, she breathed too much. No sooner had she taken one breath would she need to take another breath, and this made her stroke choppy and inefficient, and each flip turn an agony. She would burst out from the wall like a desperate whale breaching for air. It looked undignified, or perhaps simply alarming from up on deck, so her coach made her do this exercise where she was to swim very calmly with flippers on and kick eight times off each all. Calm down, he said. Take it very, very easy. At first, she practiced this exercise diligently, kicking and holding her breath, calmly, blowing a steady stream of bubbles out through her nose. The need for breath is an illusion, she told herself, free divers can hold their breath for four whole minutes. As the set progressed and the yardage accumulated, the urgency to breathe would return, and she would kick six, then four, then three times off the wall. But the exercise had its merits. Eventually, the clam learned how to hold her breath beyond the flags without any trouble. With the right kind of training, anything was possible. Yet at the same time, the clam also knew, even as she got better at holding her breath, that for her, there would never be enough breath, and she would always be gasping for air, and it would always be undignified, but as long as she did so, she would not die, and she would not suffocate. Anelise Chen is the author of So Many Olympic Exertions, out in June from Kaya Press. She teaches creative writing at Columbia University.